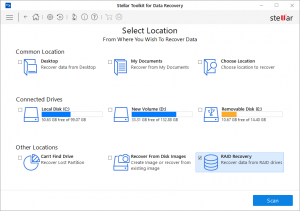 Stellar ToolKit for Data Recovery is a complete solution to recover lost data from your hard disks and removable drives. It is a complete solution for all your data loss problems. The powerful scan engine of the software does a thorough scan of the selected storage device, shows a preview of files found during the scanning process and finally saves them to specified destination. Separate options to recover documents, folders, mails or multimedia files from the storage media is also available. 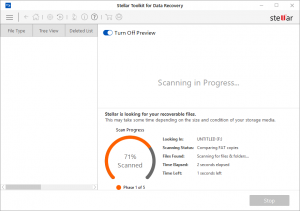 Stellar ToolKit for Data Recovery allows you to save scan information to resume recovery process from the same point, at a later stage. It also has an option to create an image of a complete hard drive or volume/partition on the drive. This image file can be used to recover lost data even when the actual hard drive is not available. This is very helpful, in case there is a probability of hard drive failure during the recovery process or the drive has lot of bad sectors. Simultaneous Scan of multiple File System (NTFS, FAT, FAT16, FAT32 and ExFat) in a logical drive. Raw Recovery support of HD-MOV (Cannon Camera model). Raw Files Recovery is done automatically with advance search. In Advanced Settings : Enhanced Support of Add New Header/Edit Header. Select Setup Language dialog box is displayed. From the drop-down list, select the desired language to use during the installation. 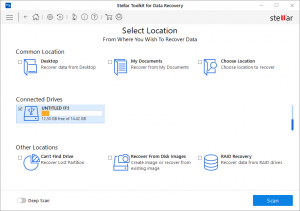 Setup – Stellar ToolKit for Data Recovery dialog box is displayed. Click Next to proceed. License Agreement dialog box is displayed. Select I accept the license agreement option in the License Agreement dialog box. Click Next. Select Destination Location dialog box is displayed. Specify a destination in the text box or click Browse to select a destination. Click Next. Select Start Menu folder dialog box is displayed. Specify a destination in the text box or click Browse to select a destination. Click Next. Select Additional Tasks dialog box is displayed. Select the required check boxes for creating desktop icon and quick launch icon of the software. Click Next. In the Ready to Install dialog box, verify the settings. Click Back to make any changes, or click Install to install the software. After successful installation of the software, the “Completed installation of Stellar ToolKit for Data Recovery” screen opens. Click Finish. Note: Clear Launch Stellar ToolKit for Data Recovery check box to prevent the software from launching automatically. Double click Stellar ToolKit for Data Recovery icon on the desktop. Everything : This option recovers all the data from a particular drive or location selected for recovery. Documents, Folders & Emails : This option recovers office documents, files, folders and mails from various email clients. Multimedia Files : Select this option to recover photos, audio and videos. It also has user-friendly buttons to quickly access the menus. Home Click this button to return to main screen at any point. Advanced Settings Click this button to configure general, file types and recovery settings. Click this button to display information about the application. Back Click this button to move to previous screen from current window. Help Click this button to open user help guide. Buy Online Click the button to buy the software online. Click this button to register the software. Click this button to move to the next window. Click this button to save the recovered data. Click this button to start the scanning process. Click this button to stop the scanning process at any time. 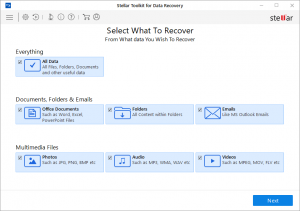 You can purchase Stellar ToolKit for Data Recovery software online. For pricing details and to place an order, if you have already downloaded and installed the demo version of the software, click directly on the (Buy) button on the main user interface. 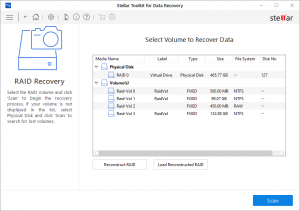 Run the demo version of Stellar ToolKit for Data Recovery software. Stellar ToolKit for Data Recovery automatically communicates with the license server to verify the entered key. If the entered key is valid, activation is completed successfully. ‘Stellar ToolKit for Data Recovery Activated Successfully’ message is displayed. Click OK.
Stellar ToolKit for Data Recovery Update Wizard keeps your copy up-to-date. The wizard runs the update process and automatically checks for updates. You need an active internet connection to check for updates using Update option of the application. Using Update option, you can check for both, latest minor and major versions available online. You can easily download minor versions using the update wizard. However, you need to purchase any major version updates whenever they are available. 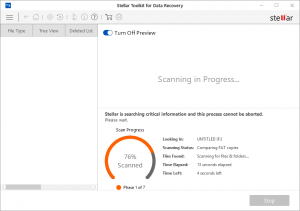 Run Stellar ToolKit for Data Recovery software. On the main screen, click Advanced Settings button. In the Advanced Settings menu, click Update button. From Updates dialog box select Check for Updates option. ‘Stellar ToolKit for Data Recovery Update Wizard‘ window pops up. Click Next to proceed. The wizard will start searching for the latest updates and if it finds any new version, a window will pop up indicating the availability an update. Click Next and the software will start downloading update files from the server. When the process is complete, the software will updated to the latest version. Tip: You need to purchase the major version updates of the software, whenever they are available. Our Technical Support professionals will provide solutions for all your queries related to Stellar Products. For price details and to place an order, click directly on the (Buy) button on the main user interface. 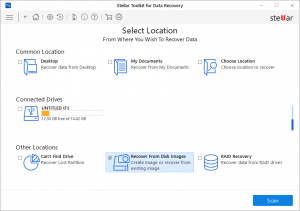 Stellar ToolKit for Data Recovery provides you different options to recover your data. To recover data, you have to first scan the hard disk or volume. 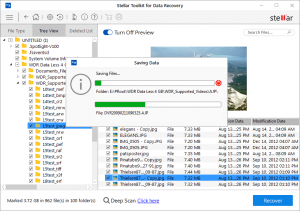 If you want to recover data using a previously scanned information or an image file, Stellar ToolKit for Data Recovery has an option of scanning them as well. After scanning, you can preview scanned files before recovery. You can also filter, find, and select the files you want to recover. You can then recover and save selected files to a destination folder of your choice. Everything – This option recovers complete data from the selected hard drive or storage media. All documents, files and folders present or deleted from the drive/media can be recovered using this option. Documents, Folders and Emails – Use to option to recover lost or deleted documents, folders and their content and mail items. Multimedia Files – Using this option you can recover deleted or lost multimedia files like photos, audios and videos. Common Locations – Common Locations include Desktop, My Documents and Choose Location. Connected Drives – These include all the drives and external storage media connected to the system. Other Locations – These include lost or deleted partitions and existing disk images. You can also recover data from deleted and lost volumes of your computer’s hard disk. 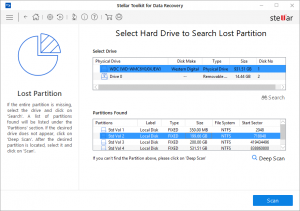 Recover Lost Partition option will list all volumes that have been deleted from your hard disk. With Stellar ToolKit for Data Recovery you can recover your deleted or lost data from the hard drive or external storage media connected to the system. Almost all data of the volume can be found by performing recovery on selected volume or removable media. NTFS, FAT, FAT16, FAT32, ExFat, Ext2, Ext3, Ext4, HFS and HFS+ file systems are supported by the application. Run Stellar ToolKit for Data Recovery. From Select What to Recover screen, select the type of data i.e. Everything, Documents, Folders & Emails or Multimedia Files, you want to recover. From Select Location screen, select a location from Common Locations or any of the Connected Drives. In case you want to scan a specific folder, from Common Locations select Choose Location. Browse to any desired location, select a folder you want to scan and click Select Folder. Click Scan. A screen showing the scanning process is displayed. Click Stop to stop the scan at any point. Running deep scan enables you to scan the selected volume thoroughly, when you are unable to locate data that you want to recover. From Select Location screen, select a location from Connected Drives. Enable deep scan which is on bottom left of your screen. Click Scan. A screen showing the scanning process is displayed. Once the scanning process is completed, details of the files and folder found are displayed in a dialog box. A CD/DVD disk might become unreadable or corrupt due to a number of factors, such as heat, dust, scratches on the disk. Stellar ToolKit for Data Recovery software can recover data from damaged CD-ROM, CD-RW, DVD and DVD-RW discs. 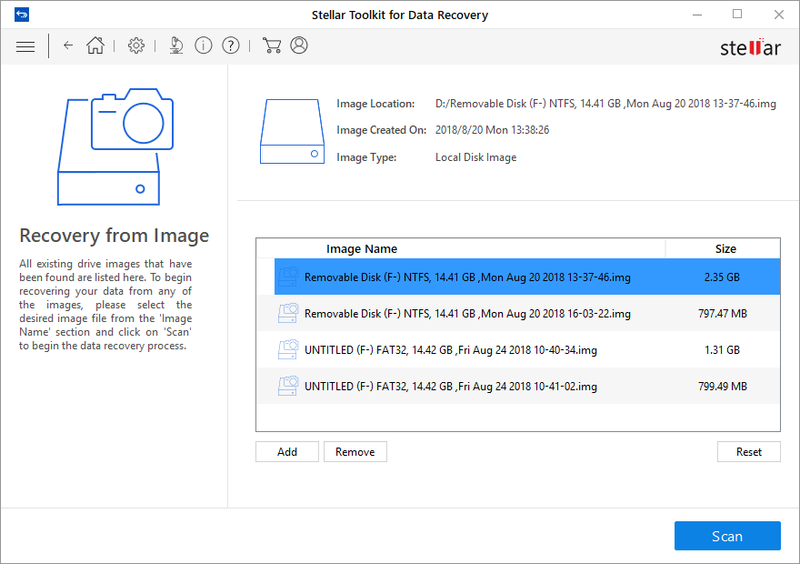 Stellar ToolKit for Data Recovery application supports recovery from corrupt optical media disks burnt on Windows, Linux, UNIX, and Macintosh systems. The application performs a scan on the selected optical media for recovery. From Select Location screen, select the connected CD/DVD drive from Connected Drives. Click Scan. Click Stop to stop the scan at any point. Note: You can select only one CD/DVD at a time for recovery. You can save scan result of any scanning process as DAT file. You can save scan result of a complete or incomplete recovery process. Saving scan information saves your time. 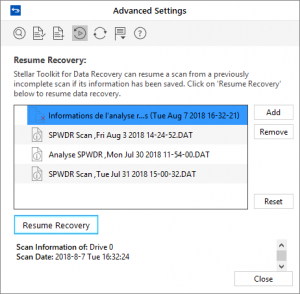 You can resume recovery by selecting the DAT file without scanning the drive again. In ‘Scan Results‘ window. Click Back button or close the application. You will be prompted to save scan information. In ‘Save scan information‘ dialog box, browse to the location where image file should be saved. Type the name of the image file in the File name text box. Click Save. Scan Information file will be saved with DAT extension. Note: If you stopped a scanning process, you can save scan information up to that point. However, you should perform complete scan, and then save scan result. Tip: It is recommended that you should save ‘scan information file’ and ‘hard disk image’ at different locations with proper name such that you can easily retrieve the required DAT file. Stellar ToolKit for Data Recovery shows the preview of the files and folders present in the scanned physical volume or the removable media. All files and folders that are found in the scanned volume or removable media are shown in a three pane structure. The three panes are the left, top-right, and the bottom-right pane. In the left-pane, a tree structure according to folders is created. Top right-pane shows preview of file that are supported by the software. In bottom-right pane, all files and folders that are in the selected folder in the tree view are listed. Click a tab in the left pane. File Type: In this view, files/folders are listed according to their type such as Document, Audio, Video, Archive, etc. Tree View: In this view, folders are listed in a hierarchical arrangement. Deleted List: All the files and folders deleted from the drive are listed in this view. Click a folder in the left pane to list files of that folder in the bottom right pane. Double-click the folder to move deeper into the folder. Click a file in the bottom-right pane to preview the file. Only supported files can be previewed. 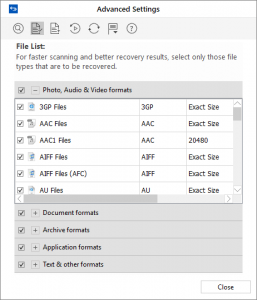 Note: If you can’t find your desired file/folder in the list of scanned and detected files, you can choose Deep Scan option to perform a comprehensive scan of the selected drive or location. 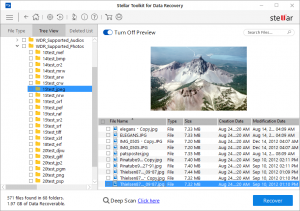 Stellar ToolKit for Data Recovery can recover all files of supported file formats. You can save files and folders listed under the preview section at a location of your choice. From the Preview window, select the files and folders you want to recover. You can narrow the search result by selecting only specific files or type of files to view or recover from the File Type tab or to recover deleted files select the files from the Deleted List. Check the root node in the left pane and then click Recover or from the file list pane select the check box besides the File Name tab and then click Recover. Click a folder in the left pane to view files stored in it. Check the file(s) in the bottom right pane and then click Recover. Click File Type List Check the File Types category folders as per your choice. The files of the selected ‘file types folders‘ will be listed in the file list pane. You can select the individual files in the list. A Recover dialog box is displayed. Click Browse to select a destination to save data or click on Advanced Settings to configure advance recovery options. Specify the destination and choose the options as per requirement. Click Start Saving to start saving process. If the destination files have same names then you can overwrite, rename or skip. Choose as per the case. 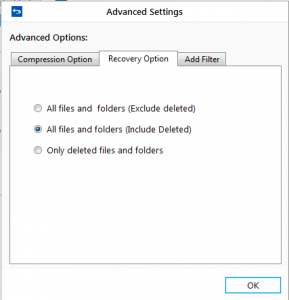 You can save recovered files in compressed zip folders. However, compression can be applied only if recovered files are being saved to a local disk or drive. From the Advanced Options select Compress Option. Zip each file individually: This option saves all selected file in their corresponding zip folder. 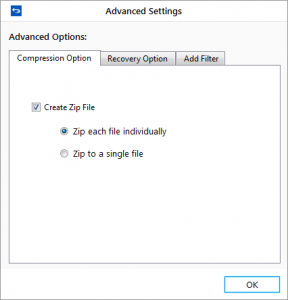 Zip to a single file: This option saves all recovered files in a single zip folder. This section is shown when all the files and folders are selected for recovery. You can choose to exclude or include the deleted files while recovery. From the Advanced Options select Recovery Option. All files & folders (Exclude deleted): Choose this option to exclude the deleted files while recovering the selected files and folders. All files & folders (Include deleted): Choose this option to include the deleted files and folders while recovering the selected files and folders. Only deleted files & folders: Choose this option to recover only deleted files and folders. You can add a filter according to your requirement. From the Advanced Options select Add Filter. Select a group of file types from the drop down box and click Add button, to include it in the list. To remove any extension from the list simple select the extension and click Remove button. 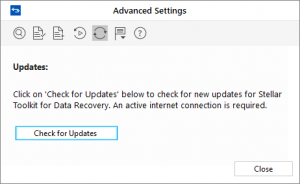 Select Include these files only to include the listed file types during recovery or Exclude these files only to leave the listed file types during recovery. 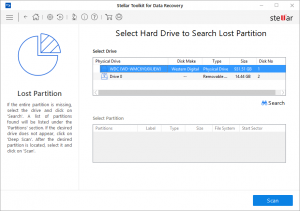 Click OK.
Stellar ToolKit for Data Recovery software allows you to search and recover data from lost and deleted partitions of a hard disk. You should use this option to recover data from an accidentally deleted partition. This option will search and list all the deleted and lost partitions in the hard disk along with existing volumes. On Select Location screen, select Can’t Find Drive from Other Locations. In the Select Drive section all the hard drives connected to the system are listed with their details. From this section, choose a hard drive you want to scan for lost partitions and click Search. A scan for lost or deleted partitions will be performed in the selected disk or drive. From the list of partitions found, select any desired partition and click Scan to continue with the recovery process. Disk Image is a mirror image of any storage device from which you wish to recover data, such as ”Internal or External Hard Disks”, ”Pen Drives”, ”Volumes”, ”Storage Cards” etc. When you create an image, scanning process is not performed; instead a copy of the selected source is saved as IMG file. You can start recovery either after completion of drive imaging or at later time by using ‘Recovery from Disk Images‘ option. 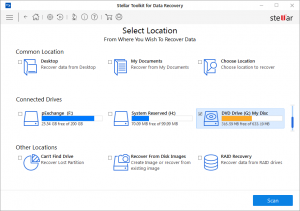 Stellar ToolKit for Data Recovery allows you to recover data from any previously created disk images or create a disk image of any drive, partition or volume and perform the recovery process on the newly created image. Additionally, you can also perform the recovery process on any previously saved scan information. Removable media such as pen drives, external hard disks etc. Images, of all sources listed earlier, are saved as IMG file. This IMG file is of same size as of the source. You can use the image files to resume recovery later. The image you create by using Stellar ToolKit for Data Recovery will be of same size as the selected hard disk, pen drive, or volume. Ensure that the location where image file needs to be saved has sufficient space to store the image file. From Select What to Recover screen, select the type of data i.e. Everything, Documents, Folders & Emails or Multimedia Files, you want to recover. Click Next. On Select Location screen, select Recover from Disk Images from Other Locations and click Scan. From the displayed dialog box select Create Image option and click Next. From Create Image screen, select the drive or partition for which you wish to create am image. To create image of the entire drive or partition click Start Imaging. Or, To create image of selected region click on Advanced Settings. 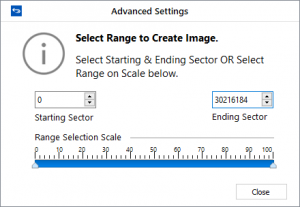 From ‘Select Range to Create Image‘ screen drag the sliders to define starting and ending sectors of the image file. Click Close, and then click Start Imaging. In ‘Create Media Image to Save‘ dialog box, locate the destination where image file should be saved. In the File Name text box, type name. Click Save. After the process gets completed, a screen is displayed below which shows the newly created image. Click Scan to start the recovery process. A screen showing the scanning process is displayed. Click Stop to stop the scan at any point. Tip: It is recommended that you should save ‘scan information file’ and ‘hard disk image’ at different locations with proper name such that you can easily retrieve the required image file. 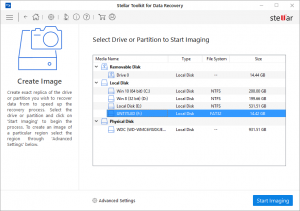 With Stellar ToolKit for Data Recovery you can perform the recovery operation on a newly created disk image using Create Image option or on any previously created disk image. From the displayed dialog box select Recover from Existing Image option and click Next. All the disk images and saved scan information are listed on Recovery from Image screen with their respective size. Select the image from which you wish recover data and click Add. Alternatively, to remove any image select that image and click Remove. To remove all the images, click Reset. After adding the images click Scan to start the recovery process. Note: You can select only one volume at a time for recovery. Deep Scan allows you to recover data from hard disk, pen drive or volumes of a hard disk. It does a comprehensive scan of the volume to recover each and every bit of lost or deleted data. It searches for lost files on the basis of file signature. This recovery option recovers everything that is found in the selected source. This option is especially helpful in case of severely corrupted volume. In case, after the quick scan process is completed and your desired file is not included in the list of files detected, you can opt for Deep Scan to perform a comprehensive scan of the selected drive or location. Once quick scan is completed, in the preview window choose Click Here option given at the bottom of the window to start Deep Scan. In case you can’t find your desired partition in the Partition Found section, you can choose Deep Scan option to perform a comprehensive scan of the selected drive for deleted or lost partition. Once the scanning process is completed, a dialog box showing the number of files and folders found during Deep Scan is displayed. Files found during Deep Scan can be viewed in the preview window and saved at any desired location. Advanced Settings can be configured to run Stellar ToolKit for Data Recovery according to personal requirement. This option make this software exceptional and easy to operate. Preview option allows you to apply settings for preview window of the application. Click Preview button from Advanced Settings window. From the options displayed, select required settings. File types give information about the type of file such as video, audio and its extension. 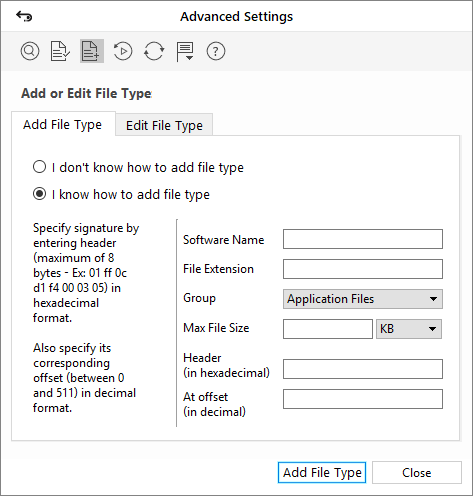 You can select file types while performing signature search such that, scanning process should search only for the specified file types. Various file types are listed in the file list option of Stellar ToolKit for Data Recovery. You can select the required file types for their recovery. Click File List button from Advanced Settings window. A list of all supported file formats is shown. Select the file types you want to recover. Stellar ToolKit for Data Recovery allows you to add additional file types apart from those already mentioned in File Lists. 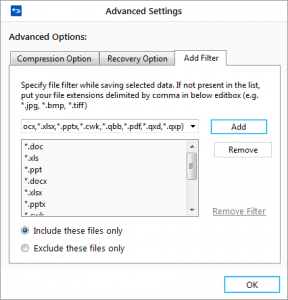 Using Add File Type option you can add a new file type or edit an existing file type to facilitate the recovery process. To add new file types manually or automatically, click Add File Type button. To edit size of existing file types, click Edit File Type button. 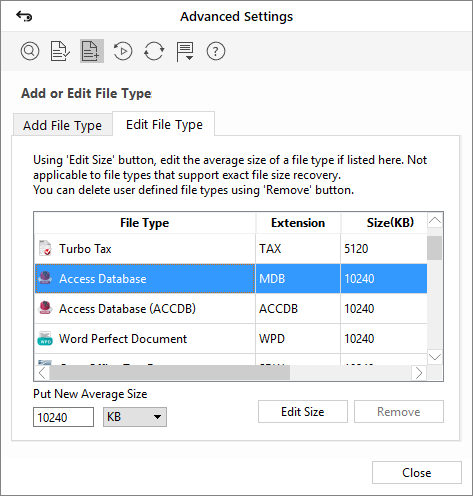 You can add new file types to the predefined list of supported file types in Stellar ToolKit for Data Recovery using Add File Type functionality in Advanced Settings window. Click Add File Type button from Advanced Settings window. Select ‘I don’t know how to add file type‘. Click Add button to browse to the location of file type you want to add. You need to add at least 10 or more sample files of the same type to include it in the list of supported file types. Name of the added file type will be listed in the left hand side box. Type in header file name in the dialog box and then select the header file type from Select Group drop down list and the size from Put Average File Size text box. Click Add File Type button. Select ‘I know how to add file type‘. Select Group from the drop down list. Specify Max File Size in KB and MB. Specify At Offset in decimal. You can also edit an existing file type or newly added file type. You can change every setting of the file type. Click Edit File Type button from Advanced Settings window. 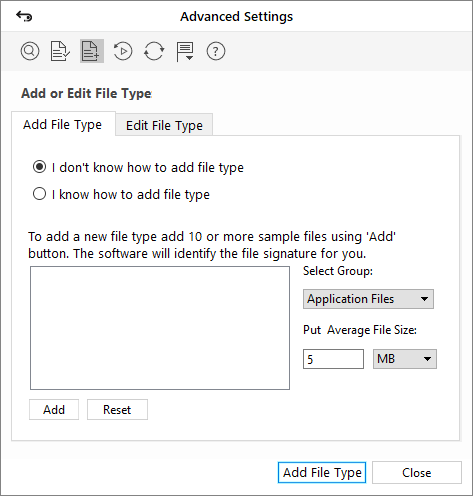 Select the desired file type from the list and enter the new size of file type in Put New Average Size box. Click Edit Size button to save the size for your file type. Click Remove button in case you want to delete the selected file type from list. Scan Information file contains information of a scan and is saved as a DAT file. You can save scan information file during any complete or incomplete recovery process. DAT file can be used to restart recovery later. For example, you saved DAT file of a scanning process and recovered only some files from that scan result. Later, you want to recover some more files from the same drive. You can use the saved DAT file to restart recovery. Using a scan information file saves time, since scanning of each file does not take place. All files and folders shown after scan process will be shown on loading the DAT file created for that scan. In addition, if you have performed scanning process but not saved any files then you can use the DAT file to restart recovery at some other time. Click Resume Recovery button from Advanced Settings window. From the list of saved scan information select the image for which you want to resume the recovery process and click Add. Similarly, to remove any image from the recovery process, select the image and click Remove. Click Resume Recovery to start recovery process. In order to use Stellar ToolKit for Data Recovery software in your preferred language, the application provides an option to select any of the desired language. Using the Languages button in Advanced Settings dialog, you can change the entire application to a different language at any time/instance without having to re-install the application. Click Languages button from Advanced Settings window. RAID, or Redundant Array of Independent Disks is a storage device made up of multiple disks. A RAID, connected to a system, is shown as one logical disk unit in the operating system. RAID is a way of storing the same data at multiple places (hard disks) to improve data access, data safety, performance, fault tolerance, and to increase the mean time between failures. Stellar ToolKit for Data Recovery software supports data recovery from three RAID levels – RAID 0, RAID 5, and RAID 6. RAID 0 is the first level of RAID technology that uses block-level striping without parity or mirroring and has no (or zero) redundancy. RAID 0 improves performance and storage but has no fault tolerance. Any drive failure will lead to total data loss and the chances of failure increases with an increase in the number of hard disks. RAID 5 is another level of RAID technology, which uses distributed parity and distributed data technique. This level requires at least three hard disks and a single disk failure does not lead to total data loss. RAID 6 level uses block-level striping with double distributed parity. This level requires a minimum of four disks and it can tolerate up to two hard disk failures. This RAID level technology is intended for high-availability systems and makes larger RAID groups more practical. To build RAID using Stellar ToolKit for Data Recovery software, you must preferably know the disk order, start sector of RAID in each disk, stripe/block size, parity repetition/delay, and parity order. Multiple possible RAIDs are constructed according to the combination of parameter options that you provide. User has to choose from any one of them. After the RAID is rebuilt, you can perform scanning and recovery operations on the RAID volumes. Click the ‘RAID Recovery‘ button in the window. The Stellar ToolKit for Data Recovery– RAID Reconstruction window is displayed. 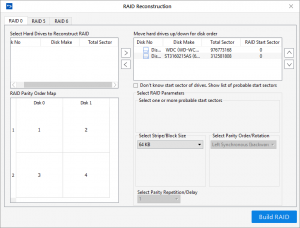 All the RAID drives and a missing drive are shown in ‘Select Hard Drives to Reconstruct RAID‘ section. 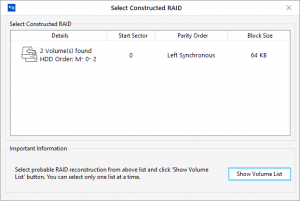 In the ‘Select Hard Drives to Reconstruct RAID‘ section, click on a RAID hard disk and then click Repeat this till all the RAID disks are shown in the Move hard drives up/down for correct disk order section. In the ‘Move hard drives up/down for correct disk order‘ section, click on a hard disk and then click or to change its order. Repeat this till all the drives are in the correct order. Click the block under RAID start sector to type the starting sector. In the ‘Select Stripe/block size‘ drop-down, select a block size. In the ‘Select Parity Order/Rotation‘ drop-down, select a rotation method. In the ‘Select Parity Repetition/Delay‘ drop-down, select a delay amount. Click . A single RAID is shown. Select it and click the Show Volume List button to continue recovery. The found volume and the RAID are shown under the RAID Recovery button on the main screen. If Stellar ToolKit for Data Recovery is not able to build a RAID and no volume is found, a Create Virtual Drive option is shown. You can perform raw recovery or search for lost volumes in it. Click it to create virtual drive. Virtual drive is shown in ‘Select Hard Drive to Search Lost volume‘ in RAID, under the RAID Recovery button on the main screen. Click the Reconstruct RAID button to perform construction from once again, or click Load Constructed RAID button to select another constructed RAID from the list of probable RAIDs. To build RAID using Stellar ToolKit for Data Recovery software, the user must preferably know the disk order, start sector of RAID in each disk, stripe/block size, parity repetition/delay, and parity order. If any of the RAID parameters are not known, the user can select the possible options provided in the recovery window. Multiple possible RAIDs are constructed according to the combination of parameter options provided by the user. The user can choose one of them. 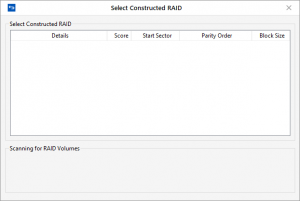 After the RAID is rebuilt, user can perform a scan and recovery on the RAID volumes. Click the RAID Recovery button in the window. 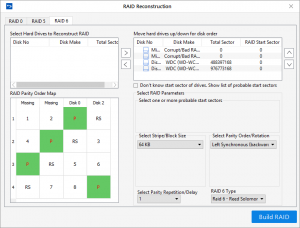 The Stellar ToolKit for Data Recovery – RAID Reconstruction window is displayed. 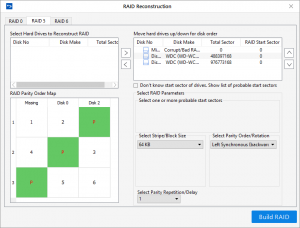 In the ‘Select Hard Drives to Reconstruct RAID‘ section, click on a RAID hard disk and then click Repeat this till all the RAID disks are shown in the ‘Move hard drives up/down for correct disk order‘ section. In ‘Move hard drives up/down for correct disk order‘ section, click on a hard disk and then click or to change its order. Repeat this till all the drives are in the correct order. Click the block under RAID start sector to type the starting sector. If you don’t know the starting sectors, check ‘Don’t know start sector of drives. Show list of probable start sectors‘. In the Select one or more probable start sectors section, select all the possible start sectors. You can also use the Add Sector button to add a start sector, if it is not listed. In ‘Select Stripe/block size‘ drop-down, select a block size or select ‘Don’t know‘ option to choose probable block sizes from a list. If you have selected the ‘Don’t know‘ option, a ‘Select one or more block sizes:’ list is displayed. Select the possible block sizes. In the ‘Select Parity Order/Rotation‘ drop-down, select a rotation method, or select ‘Don’t know‘ option to choose probable rotation methods from a list. In ‘Select Parity Repetition/Delay‘ drop-down, select a delay amount. Click . The recovered RAID is shown. If you have used the ‘Don’t know‘ option for one or more of the RAID parameters, a list of probable RAIDs are constructed and shown in a list. RAID information is also shown. Select one of the RAIDs according to its score and click the Show Volume List button. RAID volumes are shown on the main screen, under the Raid Recovery button. Click the Reconstruct RAID button to perform construction once again, or click Load Constructed RAID button to select another constructed RAID from the list of probable RAIDs. After you have build a RAID, RAID and all RAID volumes will be displayed in the ‘RAID Recovery’ screen. You have to scan a RAID volume to recover data in that volume. You can select only one volume at a time for scanning. Almost all the data in the files and folders will be found by performing recovery on the selected volume or removable media. FAT, NTFS and ExFAT file systems are supported by the software. After you build RAID, RAID volumes are displayed in the ‘Select Volume to Recover RAID Data‘ section of Raid Recovery. Select the volume to be recovered. Click Settings in the application tool bar and configure the settings. 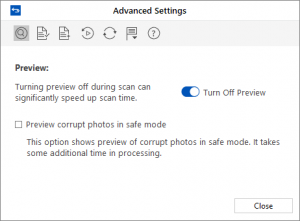 Deep Scan: In case, your desired file is not included in the list of files detected, you can opt for Deep Scan to perform a comprehensive scan of the selected drive or location. Note : The option to save scan information is not available for RAID Recovery. Are only audio, video, documents and photos recovered by this software? No, all the files and folders in the selected volume can be recovered. I have deleted a volume. Can I recover the files in it? Yes, choose the Recover Lost Partition option in the application to find the lost or deleted volumes. Then continue with the scan option to recover data from the deleted volumes. What is quick scan and deep scan? Quick scan is a faster scanning option. If the files are not recovered still, then you can use deep scan. Deep scan is a bit slower but results are better than quick scan. How much time Stellar ToolKit for Data Recovery will take to recover data? The recovery time depends upon the size of the hard disk or volume. If the process is running that means that software is still scanning the deleted files and you have to wait for recovery process to complete. Once the process is complete you can save the repaired file at any selected location. Yes, you can recover data from ExFAT partition. Stellar ToolKit for Data Recovery software supports NTFS, FAT, FAT16, FAT32, ExFat, ExFat, Ext2, Ext3, Ext4, HFS and HFS+ file systems. You can search for a specific file in the preview window or from File Type List tab check the File Types category folders as per your choice. The files of the selected ‘file types folders‘ will be listed in the file list pane. Select the file(s) and click Recover. The files are saved at the selected destination. Scan the drive or volume from which you want to recover data. From list of scanned files, select the files you want to recover and click Recover. Select destination to save recovered files and click Start Saving to start saving process. What is create image, why do I need it? 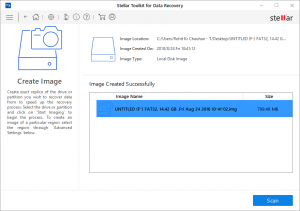 Using the Create Image option of Stellar ToolKit for Data Recovery you can create an image of different storage devices and save them as IMG file. This IMG file can be used to resume the recovery process at a later stage. Yes, you can recover only photos from removable devices like pen drive, memory card etc. Select Photos option from Select What to Recover screen to search the files according to your criteria. Stellar ToolKit for Data Recovery software, accompanied user manual and documentation are copyright of Stellar Information Technology Private Limited with all rights reserved. Under the copyright laws, this user manual cannot be reproduced in any form without the prior written permission of Stellar Information Technology Private Limited. No Patent Liability is assumed, however, with respect to the use of the information contained herein. Stellar ToolKit for Data Recovery® is a registered trademark of Stellar Information Technology Private Limited. Windows XP®, Windows Vista®, Windows 7®, Windows 8®, Windows 8.1®, Windows 10® are registered trademarks of Microsoft® Corporation Inc. This license applies to the standard-licensed version of Stellar ToolKit for Data Recovery. If you do not agree to all of the terms and conditions of this License then do not copy, install, distribute or use any copy of Stellar ToolKit for Data Recovery with which this License is included, you may return the complete package unused without requesting an activation key within 30 days after purchase for a full refund of your payment. The terms and conditions of this License describe the permitted use and users of each Licensed Copy of Stellar ToolKit for Data Recovery. For purposes of this License, if you have a valid single-user license, you have the right to use a single Licensed Copy of Stellar ToolKit for Data Recovery. If you or your organization has a valid multi-user license, then you or your organization has the right to use up to a number of Licensed Copies of Stellar ToolKit for Data Recovery equal to the number of copies indicated in the documents issued by Stellar when granting the license. Each Licensed Copy of Stellar ToolKit for Data Recovery may either be used by a single person or used non-simultaneously by multiple people who use the software personally installed on a single workstation. This is not a concurrent use license. All rights of any kind in Stellar ToolKit for Data Recovery, which are not expressly granted in this license, are entirely and exclusively reserved to and by Stellar Information Technology Private Limited. You shall not rent, lease, modify, translate, reverse engineer, decompile, disassemble or create derivative works based on Stellar ToolKit for Data Recovery nor permit anyone else to do so. You shall not make access to Stellar ToolKit for Data Recovery available to others in connection with a service bureau, application service provider or similar business nor permit anyone else to do so. Stellar ToolKit for Data Recovery and all accompanying software, files, data and materials are distributed and provided AS IS and with no warranties of any kind, whether expressed or implied. You acknowledge that good data processing procedure dictates that any program including Stellar ToolKit for Data Recovery must be thoroughly tested with non-critical data before there is any reliance on it and you hereby assume the entire risk of all use of the copies of Stellar ToolKit for Data Recovery covered by this License. This disclaimer of warranty constitutes an essential part of this License. In addition, in no event does Stellar authorize you or anyone else to use Stellar ToolKit for Data Recovery in applications or systems where its failure to perform can reasonably be expected to result in a significant physical injury or in loss of life. Any such use is entirely at your own risk and you would not hold Stellar responsible for any and all claims or losses relating to such unauthorized use.